Change is the only constant that lets you grow, evolve and progress. Like people, even the most popular and dominant brands need to innovate and refresh themselves to maintain and grow their leadership. In tune with this vision, Suryan FM 93.5 chennai is celebrating its 13th anniversary this month with revamped content aimed at providing “enhanced entertainment and celebration”. Suryan FM listeners will get to experience high-octane entertainment with refreshing shows featuring popular RJs, augmented humour and unmatched Kollywood coverage. Bringing in a fresh experience in Suryan FM are 3 new shows titled ‘Chennai mail’ (7am-9am), ‘Injimarappa’ (3pm – 4pm) and ‘Samosa’ (8pm- 9pm) with innovative segments for each show. The station hopes to rope in even more female listeners across age groups as its popular women oriented show ‘Magalir mattum’ (1pm to 3 pm) is now extended to a 2- hour format with added interactive segments and fun conversations. 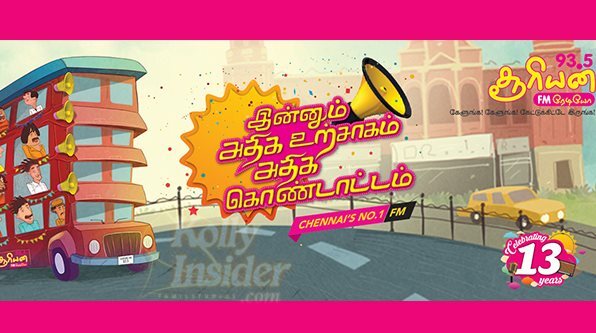 The station has topped it all with a laughter riot in the form of a revamped ‘Chinna thambi periya thambi’ and ‘Blade no. 1’ that have won popular attention of the listeners ever since the shows’ launch.